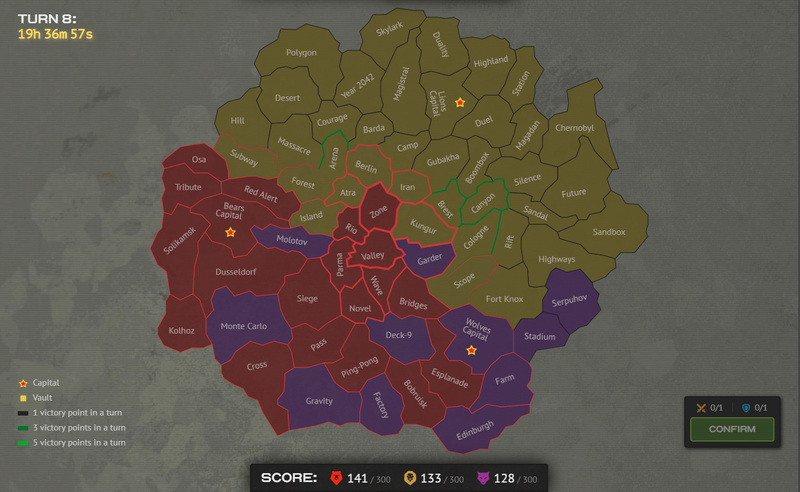 Factions continue to fight for supremacy in the War, and no side is easing up the pressure. Turn 7 is now complete, and this means it’s time to recount the events of the last game day. Lions captured Scope, Fort Knox, Highways, Kungur, Island, Forest, Subway and Hill. Wolves captured Garder, Molotov and Monte Carlo. Wolves — 128 victory points. Participate in the War, come up with team strategies on the Forum and in the game chat of the War and don’t forget, the more active you play and the more stars you earn, the higher is your chance to get into Top-10 and get the unique Legacy-skin set.